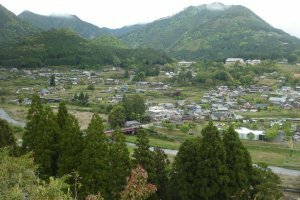 Chikatsuyu-oji is a small village located in a mountain basin about halfway between Takijiri-oji and the Hongu Taisha (the Hongu Grand Shrine) on the Nakahechi pilgrimage trail in the Kumano area. 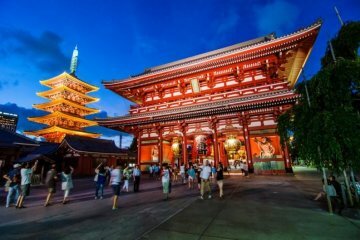 This is an ideal place for staying overnight on a two-day walk to the Hongu Taisha shrine. 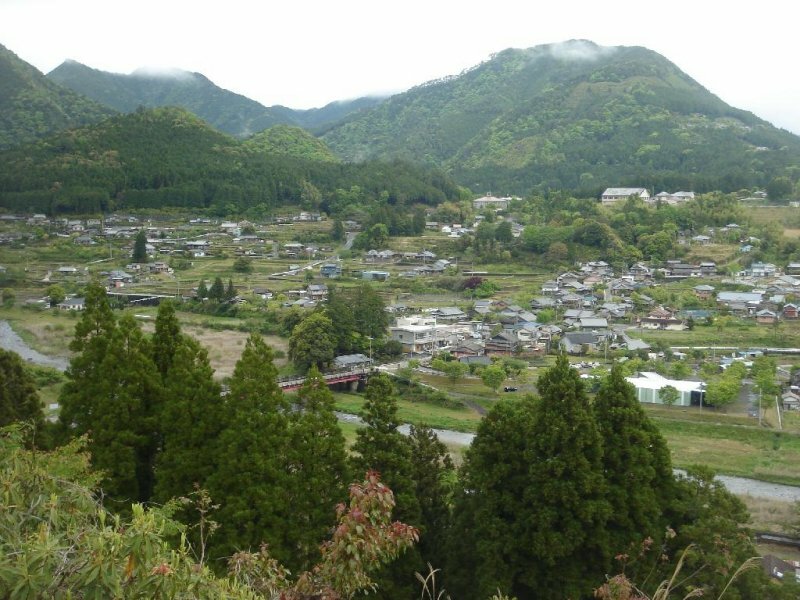 After walking along the Nakahechi mountain trail for hours, the sight of this small settlement promises a well-deserved break. Soak your tired legs in onsen water and enjoy the hospitality of the locals. 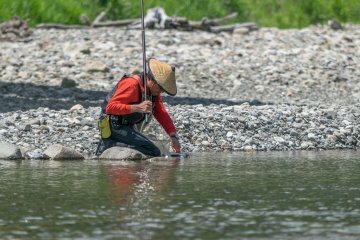 You can first catch a glimpse of the river and the Chikatsuyu-oji settlement when you decent from the surrounding mountains. 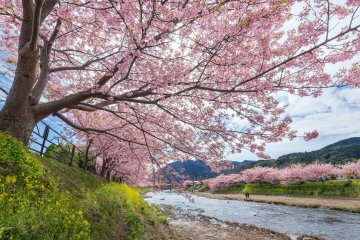 Crossing the bridge over Hiki River, tired pilgrims and hikers will find the most luxurious facilities that a secluded Japanese mountain village can offer, namely a Coop grocery store, a post office and some minshuku (B & B). 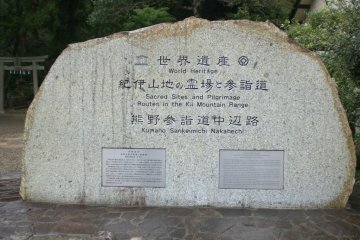 In the old days pilgrims would perform cold-water purification in the river, one of many religious rites they performed on their way to the tree holy Kumano Grand Shrines. Nowadays you may soak your aching legs in the hot water of a local onsen (hot spring). 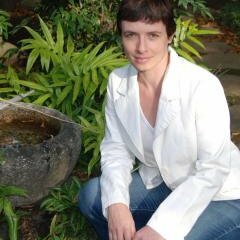 Whether you want to say a prayer while relaxing in the hot spring waters is entirely up to you but walking along the old Kumano pilgrimage trails lends to introspection and to thinking about your own spiritual roots. 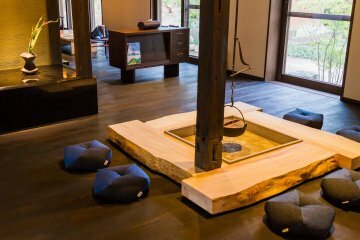 An ideal place to stay overnight is Minshuku Chikatsuyu. The modern one-storey house was built right next to Hiki River which you can overlook from the dining room while enjoying a delicious Japanese dinner and breakfast. 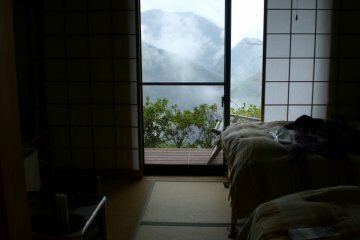 The rooms are simple Japanese style, meaning that you will sleep on a futon on the tatami floor. The shared indoor onsen is housed in a small building next to the minshuku where guests bath and relax. While there are some other options for accommodation in the area, hikers and pilgrims on the Nakahechi trail appreciate the hot, soothing waters of Hisui-no-yu onsen located right next to the minshuku after a long day’s walk. Guests of the minshuku may use this onsen for free while non-guests pay yen 550 (adult). After crossing the bridge over Hiki River (coming from Takijiri-oji), you will easily find the minshuku and the onsen near Chikatsuyu-oji, the Oji, or subsidiary shrine of the Kumano Grand Shrine, after which the settlement has been named. 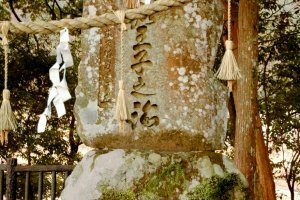 Searching for this Oji, don’t look for a wooden shrine building but for a large rock with kanji inscription and a shimenawa, a sacred rope, around it. 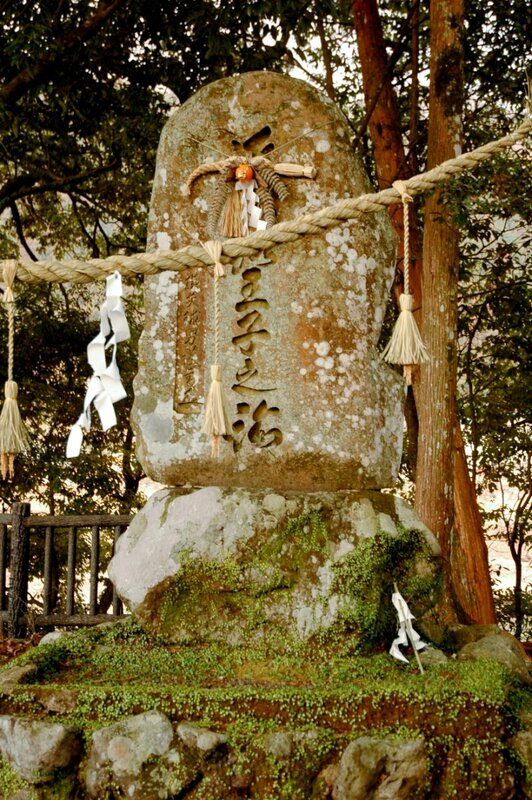 Along the Kumano Kodo trails you will often see these sacred ropes bound around rocks and trees in Japan. These spots notify a shintai, a holy place where a kami is thought to reside. 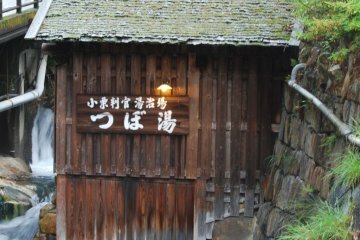 The cost for an overnight stay at Minshuku Chikatsuyu of around 9,400 yen per person (adults; depending on season) includes breakfast and dinner. This might sound a bit expensive at first but you have to consider that some sumptuous Japanese meals are included in the price, in addition to a glass of the owner’s delicious home-made plum liquor. He is also very knowledgeable about the Kumano area and he took time to answer my questions (in Japanese though) and drew a map of the Kumano Kodo trail from Hongu Taisha to Nachi Taisha (Nachi Grand Shrine), the second of the three Kumano Grand Shrines. In fact, there are no other places in the Chikatsuyu-oji settlement other than minshuku and the local Coop store where you can get some meals. I would recommend to take the bento (lunch box) prepared by the owner’s wife at a small extra cost. If you are walking towards the Hongu Taisha, then you have a long day ahead and there are not many options for getting food along the trail. With a delicious bento in the rucksack and some friendly words for the way you are well equipped for your onward journey to the Hongu Taisha, the goal of all pilgrimage trails in Kumano.